How Do You Secure Your Restaurant Patio and Keep Your Customers and Employees Safe? 🔴 If you are a business owner with a restaurant, there are some very specific challenges you deal with, least of all security and safety of your staff and location. 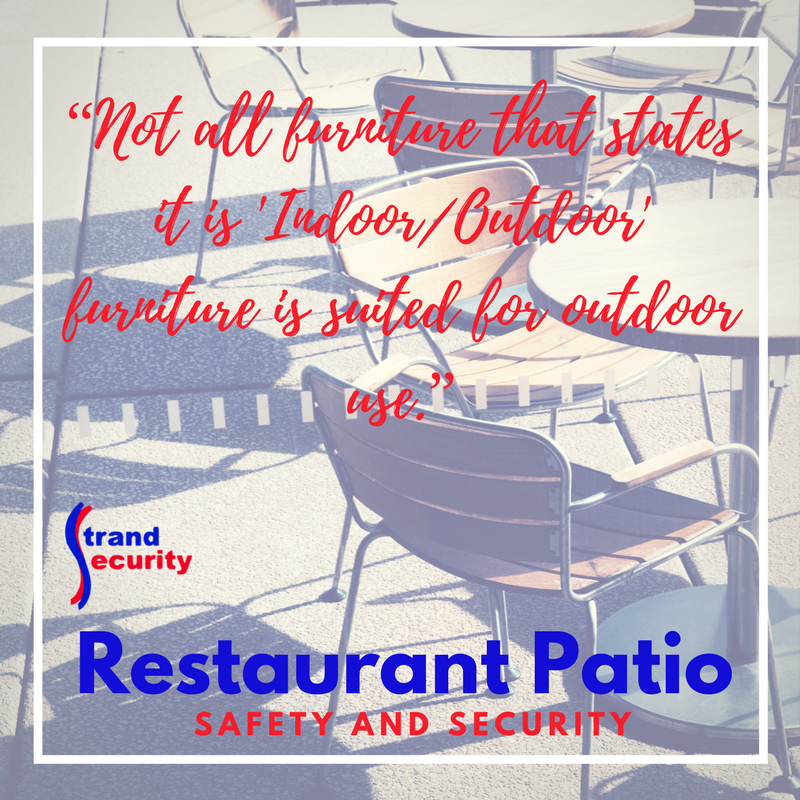 🔴 If you offer outdoor seating at your restaurant, that restaurant patio will come with its own security and safety issues (as you might already know if you own such a venture). 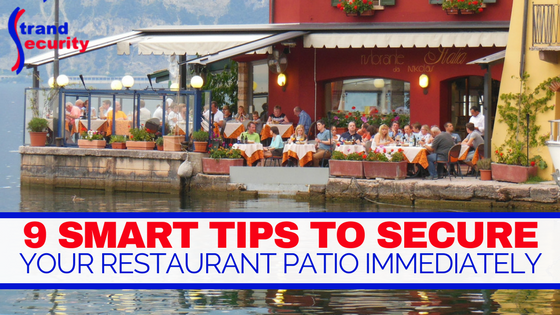 🔴 If you are new to owning a restaurant, or need to fix some ongoing safety and security issues, and are interested in adding a patio, read on! Safety First, Security a Close Second! Staff and customer safety should be most important, so let us start with potential restaurant patio safety concerns. Here are some safety concerns to consider. If you allow smoking on your restaurant patio, be prepared for potential fire safety issues. You will need to provide portable ashtrays and have a fire safety plan in place for your employees and review this plan often, especially with newly hired help. Also, have a fire extinguisher on hand and its location clearly marked. These heaters are great for extending your outdoor seating season. They are also a great attraction to (young) children yet they are so dangerous as they can burn someone so quickly! Review the location of each heater and make sure your staff is fully aware and trained to avoid hitting these hot heaters while serving your customers. Having a designated ‘heater patrol’ staff member for each shift will prevent accidents like accidental overheating or leaving these heaters on overnight. Not all furniture that states it is ‘Indoor/Outdoor’ furniture is suited for outdoor use. Metal furniture can heat up in the sun and cause burns. The glare off of glass table tops can also burn customers, or if the glass breaks it can cause a big problem for your customers and staff alike. Cushions that aren’t water repellant or aren’t meant to use outside can produce mold and mildew and untreated wood furniture like picnic tables that aren’t finished, can cause splinters. Just be cautious as you pick the outdoor furniture for your patio and be diligent as to keeping it clean and functional. Certain plants and trees are poisonous. Make sure to speak with a master gardener who is familiar with your local flora and can steer you towards the right plants, trees and shrubs to plant near and on your patio. 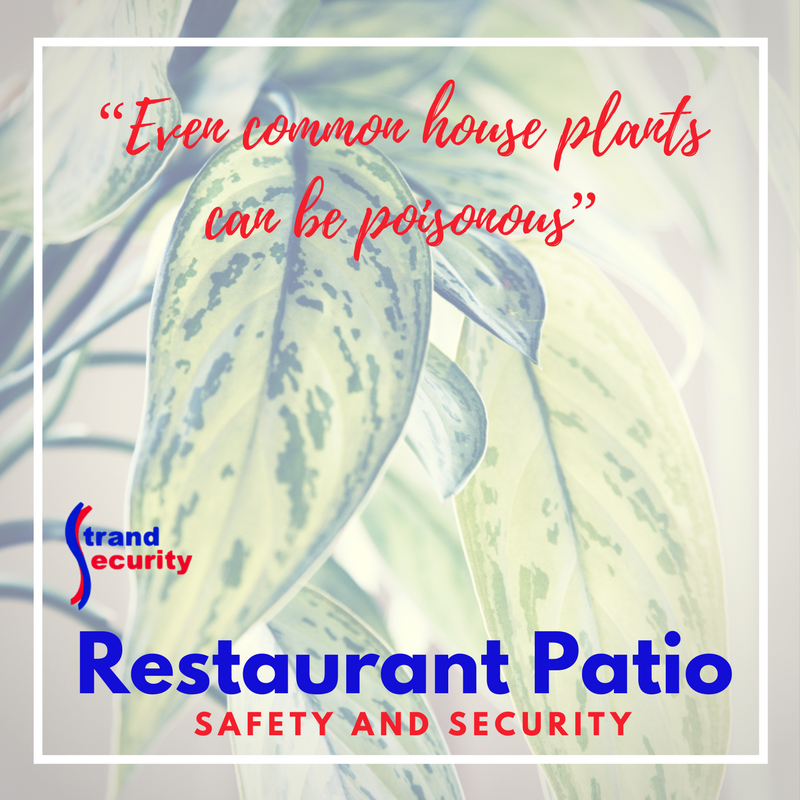 Even common house plants can be poisonous and have poisonous leaves. It would only take a minute for a child, or a pet, to eat these and get sick. As far as safety is concerned, allowing dogs on your outdoor seating area, your restaurant patio, can land you in a precarious situation. The most important thing to remember is to have a pet policy in place and train your staff to adhere to this policy, no matter what you decide – to allow or to disallow. If you do allow dogs on your outdoor seating area, have water dishes handy and even some dog-friendly treats on the menu. Be aware that trained service animals should never be denied access to your restaurant. If you patio is near a road, or near water, make sure to have adequate fencing or any type of barrier in place, as well as clearly marked warning signs. Parents with small children should be made aware of the dangers of the traffic and/or water nearby as to keep a close eye on them. Now that you understand some of the restaurant patio safety concerns, let’s look at the security issues. The main security issue of an outdoor seating area or restaurant patio is theft. This can mean people leaving without paying, or theft of cash and furniture. 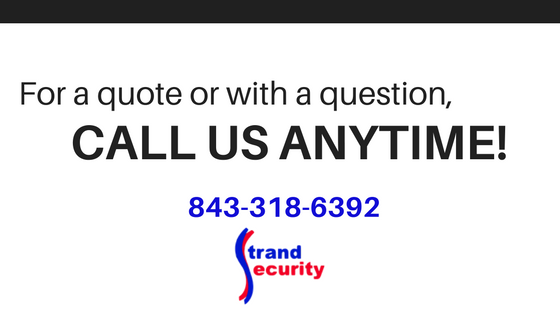 A close second security issue is personal safety. Here are some deterrents and equipment to help you keep your restaurant patio, and your outdoor staff, secure at all times. Security cameras trained on your personnel can keep them safe from harm, but it can also help you keep your business secure as you can monitor your staff at the cash register, the bar, the kitchen etc. preventing mistakes and theft. Security cameras on the patio can help monitor your outdoor area for theft and vandalism during off hours, when the restaurant is closed. Tie the cameras into your security system and you should be able to monitor this area in real time, for example using the Honeywell Total Connect™ app. We have found that most outdoor seating areas do not have a point of sale area; those are mostly left inside for obvious security reasons. 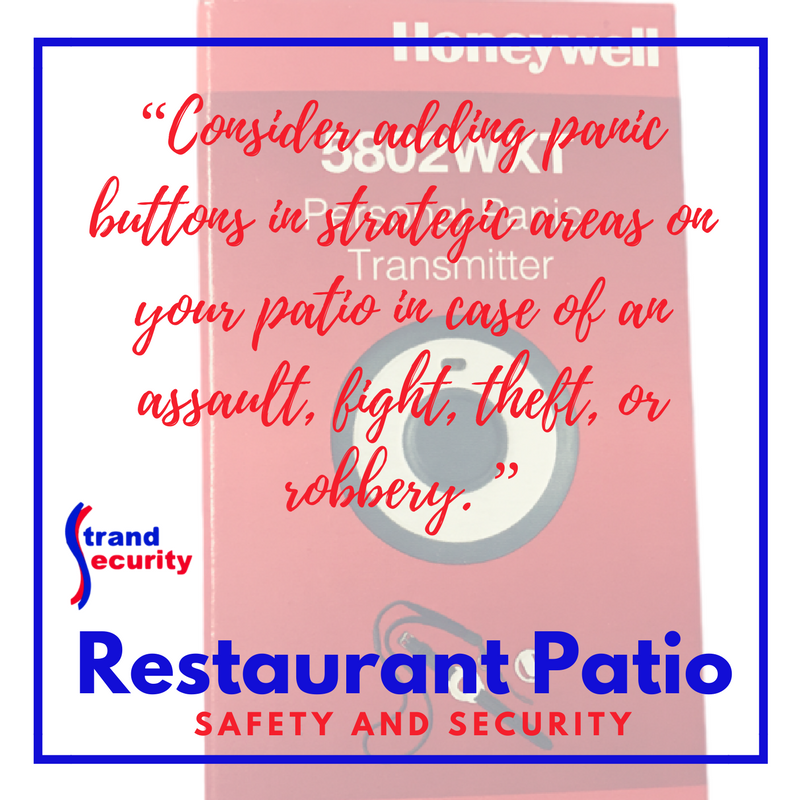 However, your staff does work outside and their safety and security is important enough that you should consider adding panic buttons in strategic areas (easy to reach, easy to disguise) on your patio in case of an assault, fight, theft, or robbery. Training your staff will be important for these panic buttons to be effective. Lights add a layer of security – no criminal wants to be in the spotlight! We suggest you instal motion-sensitive floodlights on your patio to trigger when trespassers enter the private patio area during off hours. Enjoy your summer – enjoy your outdoor seating, but above all, enjoy a thriving business without safety or security issues!